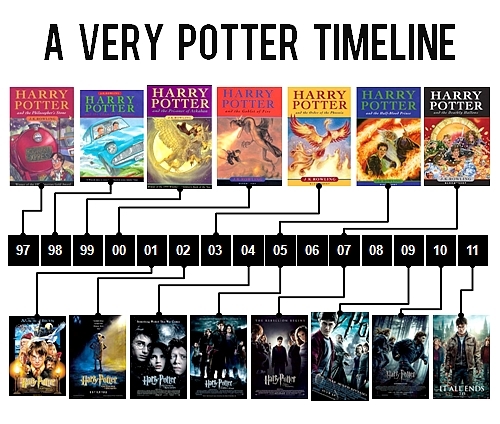 A Very Potter Timeline. . Wallpaper and background images in the Harry Potter Vs. Twilight club tagged: harry potter timeline. This Harry Potter Vs. Twilight photo might contain anime, grappig boek, manga, cartoon, and stripboek. Harry Potter has taught me so many life lessons! When the 1st book came out it was the year i I was born and now i'm 14!i'm going to miss them! I wish JK Rowling should've write more HP's! I wish it doesn't have to end! I will surely miss it! I was only two when it all started. I only started Harry Potter at 13, but it's been a great three years. I started reading the HP series pretty late, but I'd rather enjoying it while I still can than not at all. I agree with the two who posted before me.